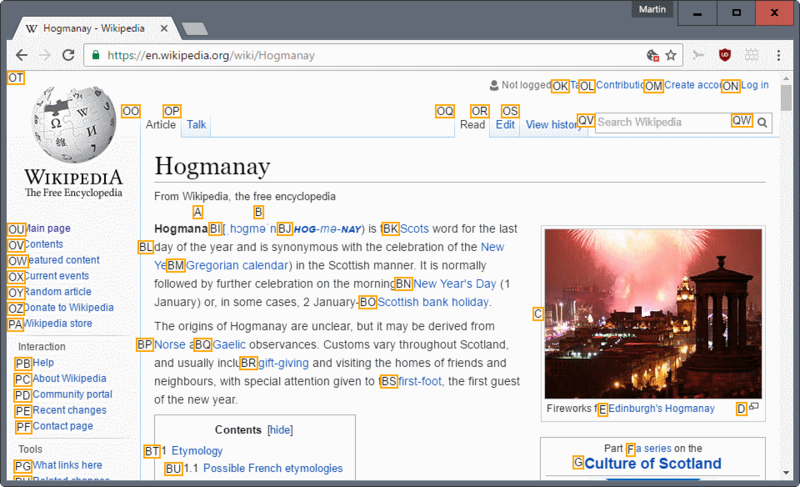 Keyboard Navigation is a free browser extension for Google Chrome to navigate web pages using the computer keyboard. Computer users sometimes run into situations where they won't or can't use a computer mouse. Think of a netbook or notebook for instance. A mouse is highly impracticable in certain situations, for instance when you are accessing the computer in a car, train, or while you are sitting in a park. While you can do with the touchpad at times, provided that the mobile computer ships with one, it is usually not the fastest solution in existence. Additionally, some users may prefer to use the keyboard for certain operations, especially if they have both hands on the keys anyway. Keyboard Navigation is a Google Chrome extension that assists users who do not have a mouse at their disposal or prefer to use the keyboard when they are using the Chrome web browser. The concept is simple: the extension displays a number next to each link on the active web page which, when typed, will load the url of the link in the browser. This can mean digits in the hundreds on some websites like Wikipedia who use automatic internal link placements. The corresponding numbers can be typed on the numeric pad or standard keyboard. Google Chrome will start loading the website immediately after pressing one of the links. The links are displayed and hidden with the ALT G keyboard shortcut. The extension can be configured to open tabs in a new foreground or background tab (by pressing g or b). Internet Chrome users who want to install Keyboard Navigation need a Chrome 4 developer version or newer version of Chrome to do so. The extension can be downloaded from the Chrome Extensions website. Update: The author of the extension has uploaded it to the official Google Chrome web store. It can now be downloaded and installed directly from there. To get started, press the comma key on your keyboard. This will show the link hints (the numbers and also letters). To open a link, type the number of it followed by a tap on the enter key. If you want to stop the process, press comma again or ESC instead. The extension is automatically disabled if a textbox is focused. You can enable it again by hitting ESC on the keyboard. To open a highlighted link in a new tab, hold down CTRL while you hit Return. To scroll down or up, use the Spacebar or Shift-Spacebar. Keyboard Navigation has not been updated since 2011 but it works fine even in the newest versions of the Chrome browser (as of December 31, 2016). Keyboard shortcuts are handy especially on netbooks/notebooks when mouse isn’t available.